Cinematographer, production designer perspectives on "The Favourite"
A nine-time Best Cinematography Academy Award nominee--who won in 1992 for JFK, in 2005 for The Aviator and in 2012 for Hugo--Robert Richardson, ASC wasn’t interested in being covered in SHOOT’s The Road To Oscar series for individual attention. In fact, he expressly didn’t want to talk about any contributions he made to A Private War (Aviron Pictures). Rather he preferred the spotlight be on the movie itself, its director/producer Matthew Heineman, and its protagonist, the late war correspondent Marie Colvin portrayed by Rosamund Pike. Richardson would very much like A Private War to find a larger audience because of his belief in the importance of the subject matter--in this case Colvin, a journalist who sacrificed her life to show the innocent victims of war, her last report coming from Syria where she chronicled the ongoing siege’s heart-wrenching physical, psychological and emotional toll on everyday people and families. During a time when journalism itself is under attack, Richardson noted that Colvin’s story shows that there are reporters who on a daily basis are putting themselves in peril to inform the world at large of injustice, atrocities and human suffering. Richardson said he was drawn to the story and to Heineman, an accomplished documentarian who was making his narrative feature directorial debut with A Private War. Earlier this week, A Private War earned Heineman a DGA Award nomination for Outstanding Directorial Achievement of a First-Time Feature Film Director for 2018. Heineman, though, is no stranger to DGA recognition. He won DGA Awards for Outstanding Directorial Achievement in Documentary for Cartel Land (nominated for a Best Feature Documentary Oscar) in 2016 and for City of Ghosts in 2018. Akin in some respects to Colvin, Heineman too has placed himself in harm’s way as a filmmaker. City of Ghosts introduced us to a band of Syrian citizen journalist rebels who risk their lives to document the atrocities committed by ISIS in their homeland. Colvin sacrificed loving relationships, and over time her personal life started to unravel as the trauma she witnessed over the years impacted her deeply. Yet her mission to show the true cost of war led her to embark--along with renowned war photographer Paul Conroy (portrayed by Jamie Dornan)--on the most dangerous assignment of her life, in the Syrian city of Homs. Colvin was killed and Conroy was seriously injured during Syrian President Bashar al-Assad’s siege on Homs. Richardson also marveled at Pike’s performance as Colvin, which recently earned her a Golden Globe Award nomination. Richardson added that he very much needed to be a part of a story which showed a fearless woman in battle, a journalist on the frontlines providing a perspective on the cost of war and bringing acts of genocide to light. “That’s why this film is so important and needs to reach as many people as possible,” affirmed Richardson who primarily deployed ARRI Alexa Minis on A Private War, describing the cameras as “versatile and malleable” for the demanding shooting situations encountered. 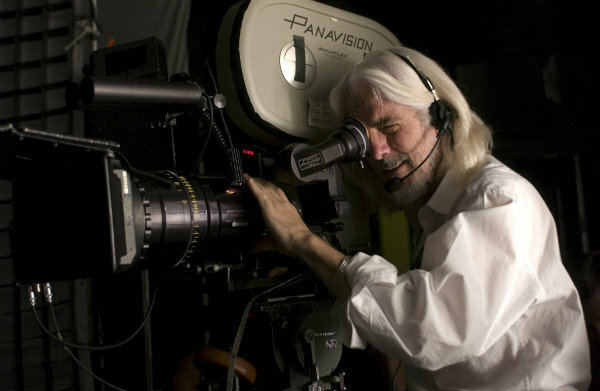 SHOOT connected with Richardson to discuss A Private War shortly after the American Society of Cinematographers had chosen him to receive the ASC Lifetime Achievement Award. The presentation will be made at the annual ASC Awards gala on Feb. 9 in Hollywood. Richardson began shooting documentaries in the 1980s. His photography on Crossfire for an English TV station caught the eye of Oliver Stone, who enlisted Richardson for Salvador. That led to Platoon, and the beginning of a prolific credit list that includes Wall Street, The Doors, A Few Good Men, Natural Born Killers, Casino, Nixon, The Horse Whisperer, both Kill Bill movies, The Good Shepherd, Eat Pray Love, and Live by Night. Born in Massachusetts, Richardson fell in love with movies and studied at the Rhode Island School of Design, before advancing to the American Film Institute in the late 1970s. He apprenticed with such legendary cinematographers as Sven Nykvist, ASC, FSF and Nestor Almendros, ASC. Richardson has thus far earned 10 ASC Award nominations starting with Born on the Fourth of July in 1990, JFK in ‘92, A Few Good Men in ‘93, Heaven & Earth in ‘94, The Horse Whisperer in ‘99, Snow Falling on Cedars in 2000, The Aviator in ‘05, The Good Shepherd in ‘07, Inglourious Basterds in 2010 and Hugo in 2012. For his work on The Favourite (Fox Searchlight), Robbie Ryan, BSC has already received accolades including winning the British Independent Film Award for Best Cinematography as well as the Audience Award at Camerimage. He’s also just been nominated this week for an ASC Award and a BAFTA Film Award on the strength of the film which takes us to the early 18th century. England is at war with the French. Nevertheless, duck racing, pineapple eating and other offbeat indulgences are thriving with people of wealth. A frail Queen Anne (Olivia Colman) occupies the throne and her close friend Lady Sarah Churchill (Rachel Weisz) governs the country in her stead while tending to Anne’s ill health and mercurial temper. When a new servant Abigail Masham (Emma Stone) arrives, her charm endears her to Sarah. Sarah takes Abigail under her wing and Abigail sees a chance at a return to her aristocratic roots. As the politics of war become quite time consuming for Sarah, Abigail steps into the breach to fill in as the Queen’s companion. Their budding friendship gives Abagail a chance to fulfill her ambitions and she will not let anyone or anything stand in her way. Ryan also thanked Stephen Murphy whom he described “as a fantastic DP” who came in for a week or so and worked on a number of night shoots. Murphy helped out when Ryan was called away due to the death of his father during the shoot. The film wasn’t shot in a conventional manner, with Lanthimos and Ryan constantly seeking out different angles and perspectives which went a long way to making the film feel different, fresh and at times unsettling. You never quite know what’s coming next. The Favourite adds to a rich filmography for Ryan which includes Philomena for director Stephen Frears, Ginger & Rosa for Sally Potter, Catch Me Daddy for Daniel Wolfe, Jimmy’s Hall , The Angel’s Share and I, Daniel Blake for Ken Loach, and Fish Tank, Wuthering Heights and American Honey for Andrea Arnold. The collaborations with Arnold have yielded multiple honors, such as a nomination for Best Technical Achievement in Cinematography from the British Independent Film Awards for Fish Tank, Best Cinematography distinction from the Venice Film Festival, the Camerimage Bronze Frog Award and Best Technical Achievement in Cinematography from the Evening Standard British Film Awards for Wuthering Heights, and a Cannes Jury Prize and a British Independent Film Award for Outstanding Achievement in Cinematography for American Honey. For Lanthimos and Ryan on The Favourite, production designer Fiona Crombie’s efforts supported the movement of the camera. She made sure there was enough room to roam and push the perspective as needed. Negative space--historically accurate sparseness--was as important as the material objects in a room in order to give the camera optimum mobility. At the same time, the wide angle lenses and 360-degree whip pans by Ryan showcased Crombie’s work from floor to ceiling to the corners of each room. The environments she created were on full display in relation to the characters. It’s a display that has already been favorably received as The Favourite won the British Independent Film Award for Best Production Design and was nominated for the same honor by the Critics’ Choice Awards, the London Critics Circle Film Awards and the Los Angeles Film Critics Association Awards. Earlier this week, Crombie garnered both a BAFTA Film Award nomination and an Art Directors Guild Excellence In Production Design Award nom in the Period Film category for The Favourite. This is the tenth of a multi-part series with future installments of The Road To Oscar slated to run in the weekly SHOOT>e.dition, The SHOOT Dailies and on SHOOTonline.com, with select installments also in print issues. The series will appear weekly through the Academy Awards gala ceremony. Nominations for the 91st Academy Awards will be announced on Tuesday, January 22, 2019. The 91st Oscars will be held on Sunday, February 24, 2019, at the Dolby Theatre at Hollywood & Highland Center in Hollywood, Calif.,and will be televised live on the ABC Television Network. The Oscars also will be televised live in more than 225 countries and territories worldwide.